I’m afraid that often as nonprofit leaders, we’re overlooking one of the most powerful elements we have at our disposal when it comes to vision casting, recruiting new volunteers, and raising those all important donor funds. Do you know what it is? It’s the power of story. Stories are hands down one of the most important things that we can collect, because they represent the transformation we’re all hoping our organizations are contributing to. And yet, my experience is that most nonprofits and ministries simply aren’t intentional about collecting them. Well, there are probably a variety of reasons. We’re busy, which is true and usually at the top of the list of excuses for why we don’t. But I think there are a couple of other issues that are keeping us from collecting some of the powerful stories of impact. A lot of nonprofit leaders and staff simply aren’t equipped as good interviewers to unearth some of the powerful stories that are just waiting to be dug up. We miss stories that are right under our noses. 1. The story of the ones who are being directly impacted by the amazing work you’re doing. 2. The story of those who volunteer and donate so that the work can actually be done. Are you telling both stories? My observation is that while many nonprofits do a fairly good job of telling the stories of those being directly impacted (which is often logistically more difficult to collect), we ignore the stories of the internal volunteers, donors, and staff which are equally as inspiring and useful for vision casting, volunteer recruiting, and donor development. Keep in mind, sometimes the actual cause won’t immediately attract a donor or volunteer. Sometimes, you must first get their attention by showing them how it may positively impact their life first (via these donor/volunteer stories). Then, the heart for the cause often follows. How did you first get involved with (insert nonprofit or cause), and what sparked that interest? What was your first impression of (insert nonprofit)? What has surprised you most about working with (insert nonprofit or cause)? What's the best thing that has happened since you started working with (insert nonprofit)? How has your life changed since working with (insert nonprofit)? What do you wish other people knew about (insert nonprofit)? Why are you supporting (this nonprofit) as opposed to other groups working on (the cause)? Tell me about some of the people you've met while working with us? Tell me about someone who has influenced your decision to work with (insert nonprofit)? What would you tell someone who is thinking about volunteering with us or donating? What do you hope will be different about the world we live in five years from now, as a result of the work we’re doing here? I’d equip every staff person in your organization with these questions and set a quota/goal for the amount of stories to be gathered in a year. Anytime someone get an opportunity to interact on a personal level with a volunteer or donor, they should be acquiring these interviews. You’ll be amazed at the incredible stories that will begin to surface, and the resulting impact it will have on potential new advocates for your cause. 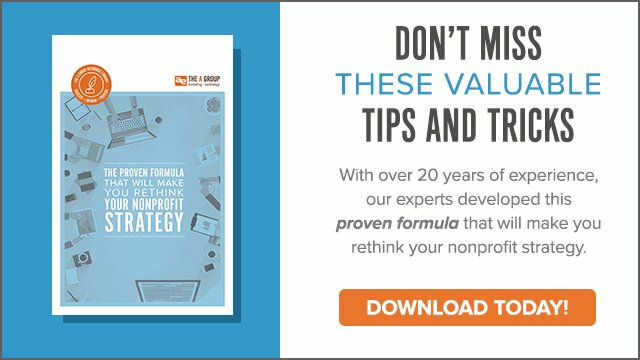 If you're interested in learning more about ways to enhance your nonprofit's strategy, download our free white paper, The Proven Formula That Will Make You Rethink Your Nonprofit Strategy, below.